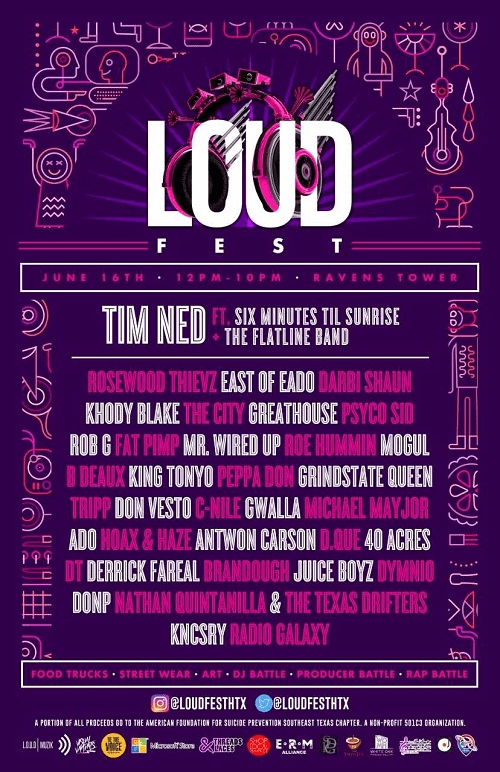 Get loud for a cause at this years’ annual L.O.U.D. FEST on June 16th in Houston, Texas. Not only will you experience a cultural showcase from a wide variety of music and entertainment, but you will also be donating to The American Foundation For Suicide Prevention with each ticket purchase. Don’t miss out on best acts from all genres including T!M NED, Khody Blake, Mr.Wired Up, Darbi Shaun, and so many more. To go along with the musical acts there will be a DJ Battle, Rap Battle and Beat Battle for the ultimate hip-hop experience. There will really be a little something for everybody this year at L.O.U.D. FEST from a Microsoft Gaming Tournament to a Threads & Laces Sneaker Summit. Of course, there will be food vendors from your favorite Houston restaurants and art from the top creative’s in Houston including painting, sculpting, drawing, jewelry making, clothing design, and more. Expect to have a lot of fun in Houston this year at L.O.U.D FEST and don’t forgot that you will be contributing to a great cause in the process.